On April 8 I published a post entitled “It’s ALL One Course!” (LINK) In that post I discussed how our various online and in-person courses seem to share similar topics. Now, after spending a weekend with Tim Freke, I think I’m beginning find out what “It’s ALL one course” really means. We journeyed to Glastonbury, England, to join Tim in a workshop he was billing as “The Philosophical Deep Awakening.” Tim is nearing completion of what will be his 23rd book, called Soul Story. Elyn and I were immersed and nearly inundated with very deep thought, alternating with heart-opening experiential exercises, which bring his ideas into our mind/body awareness in very profound ways. 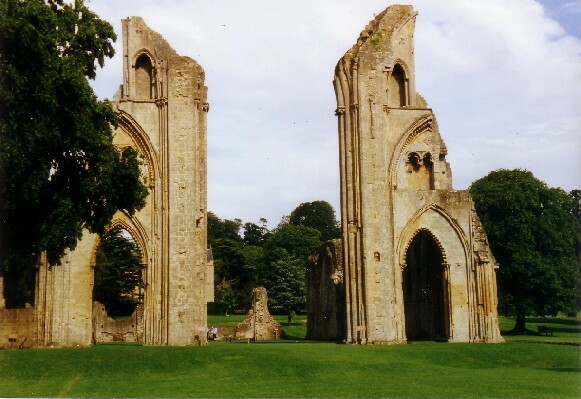 Tim’s Glastonbury events are always held at the historic Glastonbury Abbey retreat house, which is on the grounds of the Abbey ruins itself but is not open to public access. The Abbey was founded in the 7th century and was one of the most powerful monasteries in England until Henry VIII dissolved the monasteries in the 16th century. The retreat house was built on one corner of the grounds in 1829, using stones from the ruins. We are always quite comfortable in this quiet, historic building and gardens which adds to the atmosphere of the workshop. Tim doesn’t use the term “future.” Instead, he refers to “the possible.” Where I am right now is at the boundary between the past and the possible. And it is in this moment that I am creating my soul through the experiences I’m having. So my soul is in the process of formation and is evolving all the time. I realize now that “It’s ALL one course” includes the entire history of the universe from Moment Zero to this moment. By the way, Tim doesn’t use the term “Big Bang” to describe Moment Zero because it wasn’t big—it was an infinitely small point—and it didn’t make any sound because there was no air for sound to be carried in. Having just seen the stunning “Otherworlds” exhibit of photographs of our solar system at the Museum of Natural History in London, the implications of the vast reaches of space carries new meaning for me. To bring these very abstract concepts home, the group engaged in experiential exercises that put us in touch with the “Deep Awakening.” Tim is adept at creating experiences that reach amazing depths of intimacy while being totally safe. Each exercise concentrates on one of the senses. We engaged in looking at, listening to, and touching the hands of our fellow participants, all carefully orchestrated with appropriate background music. The contrast between the intense headiness of the lectures and the sensory depths of the exercises keep us totally engaged. On Saturday evening we had the special event that Tim calls the “Big Love Immersion.” After an “Incense Bath” (smudging ritual) we entered a room glowing with soft lights and gentle background music. Sitting in a looping semicircle, we looked deeply into the eyes of the person seated across from us for a few minutes, before moving on to the next person. Over the course of an hour and a half I gazed into the eyes of the 36 other participants in the workshop. This eye gazing sounds simple and perhaps even superficial, but it is a profound experience. Looking deeply into the eyes of another human being is not just looking at their physical corneas. When I gaze deeply I see through to the core of their being and another soul is looking back at me. We meet in that space that exists beyond this physical reality.